Last Wednesday, Christie’s broke a world record, well, several, but this time the potential is that at least one will last for a while….unless either auction houses, Christie’s or Sotheby’s, will have something really unique and will surprise the market. 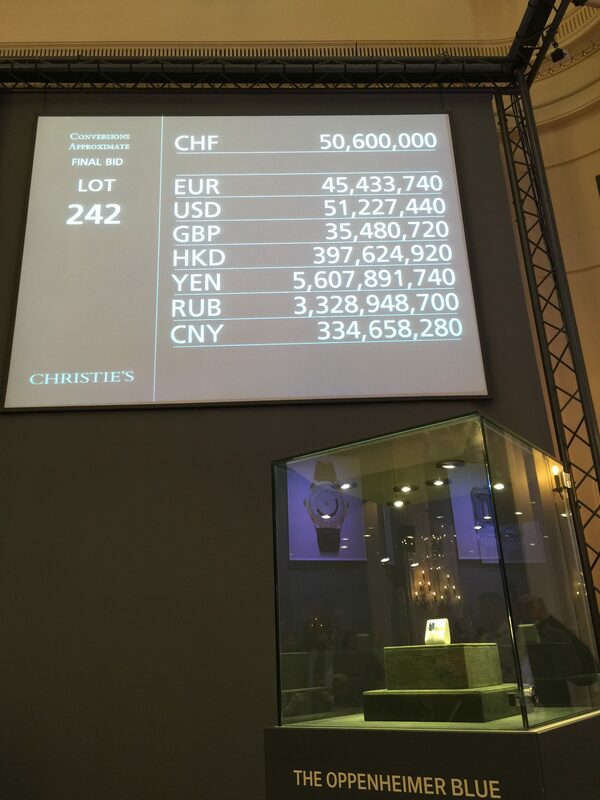 At the end, Christie’s sold a total of CHF 146,818,625, compared to CHF 171,018,625 for Sotheby’s. The crowd was wild but patient at times, for the 22 minute bidding war to end and for a single winner to be declared. At some point, they wanted for the bidding increments to increase in order to get things moving along… But at the end, the Hong Kong buyer gave in on CHF 200,000 and the winner was declared. 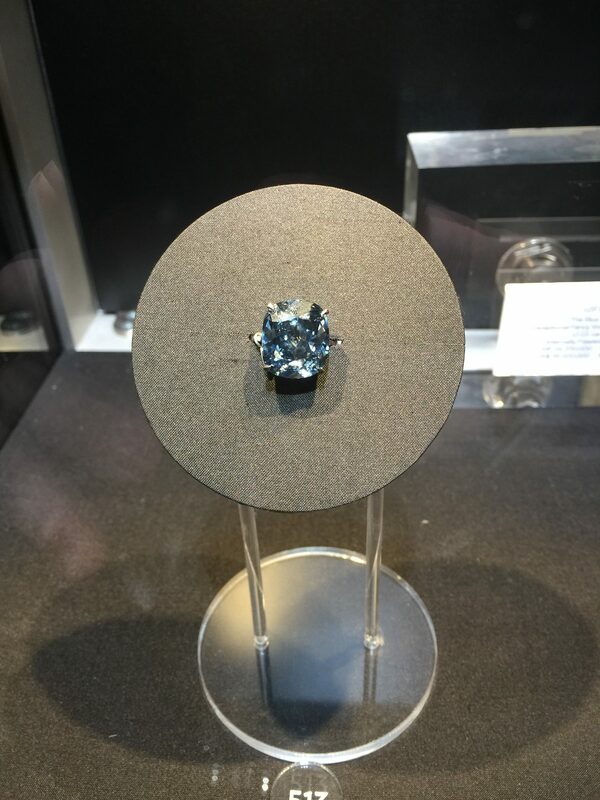 It was not announced who the winner was, as most such buyers would want to remain anonymous, but our sources tell us that a joint consortium from the High end Jewellery industry has acquired the largest Fancy Vivid Blue diamond to ever appear in auction. The 14.62 carat, Fancy Vivid Blue, Oppenheimer Diamond had an original estimation of between $37 million to $45 million. Starting bid was $30 million, and quickly gained traction to $38 million and then to $44 million, at which point two bidders left the table, leaving the last two bidders, via phone, to continue the bidding. The final price, including all related expenses and fees, put the value of The Oppenheimer Diamond at $58,002,681 or $3,967,351.64 per carat to be exact (CHF 56,837,000 or CHF 3,871,730.25 per carat). – The largest Fancy Vivid Blue Diamond to ever appear at auction, previously held by the Winston Blue at 13.22, and which sold for $23,795,372 or $1.8 million per carat. – The highest priced Jewellery ever at auction, previously held the The Blue Moon of Josephine at $48.5 million total, and was a 12.03 carat in size. Before that it was the Graff Pink, a 24.78 carat Fancy Intense Pink which Graff acquired and held that title since November 16, 2010, when it was acquired for $46,158,674 in total. What record did it not break you ask? Well, the 12.03 carat, Blue Moon of Josephine still holds a nostalgic record for the highest per carat price ever paid for any gem or jewellery at auction and that stands at $4,028,940.81 million per carat to be exact. 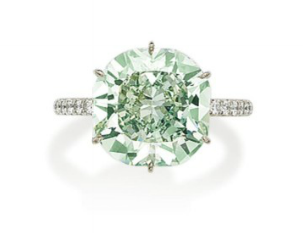 Currently, there is a strong potential that this record can be broken in the upcoming May 31 Christie’s auction in Hong Kong when it will be offering the largest Fancy Vivid Green Diamond ever to appear at auction. At 5.03 carat, it is estimated to sell between $16 million and $20 million or $3 million to $4 million per carat. we ask the question though; What would somebody willing to pay for the largest, Documented, Fancy Vivid Green diamond in the world? perhaps $4.5 million per carat? $5 million? we will only know at the end of that auction. 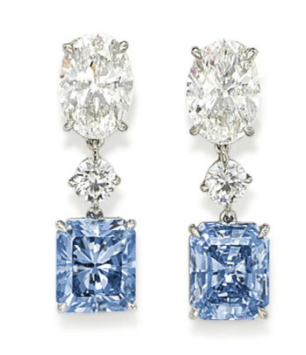 At over $482k per carat, These earrings have broken a new record for such color diamonds. 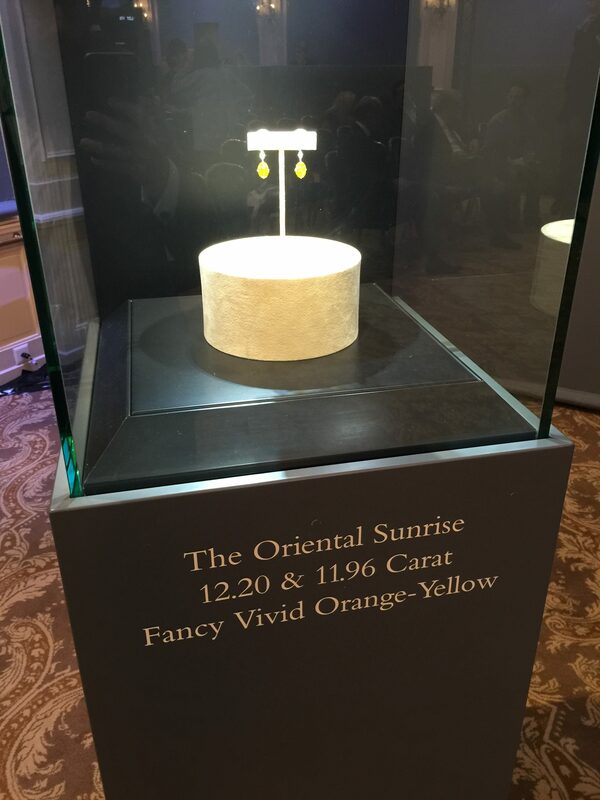 The price paid for this, also unique, pair of earrings is $6,022,780 in total, being that each of the 4 stones is unique. It would be a great challenge to break down the value attached to each diamond, but we did it. The third pair of earrings sold in the auction, have their own story. Also a perfect match, on color, shape and many other attributes, was sold for $4,874,998 or $883,151 per carat price on a 3.02 & 2.50 carats. The 7.58 carat, Fancy Bluish-Green diamond, was sold for a total of $1,542,332 total or 203,474 per carat. From the price I gather that the buyer will consider re-polishing the diamond into a Fancy Green, or maybe even Intense Green, which can potentially and substantially, increase the value of the diamond significantly. An Intense, two day trip to Geneva on behalf of buyers has paid off. 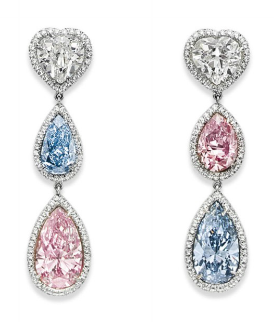 The rainbow of colors for Fancy Color Diamonds have appeared, from blue to pink, yellow and green, at auction. The results surely demonstrates the confidence both collectors, and investors alike have in Fancy Color Diamonds. It is one thing to talk about the confidence, and hear it, but it is a total different story when such prices and actions put their stamp on, and confirms it. 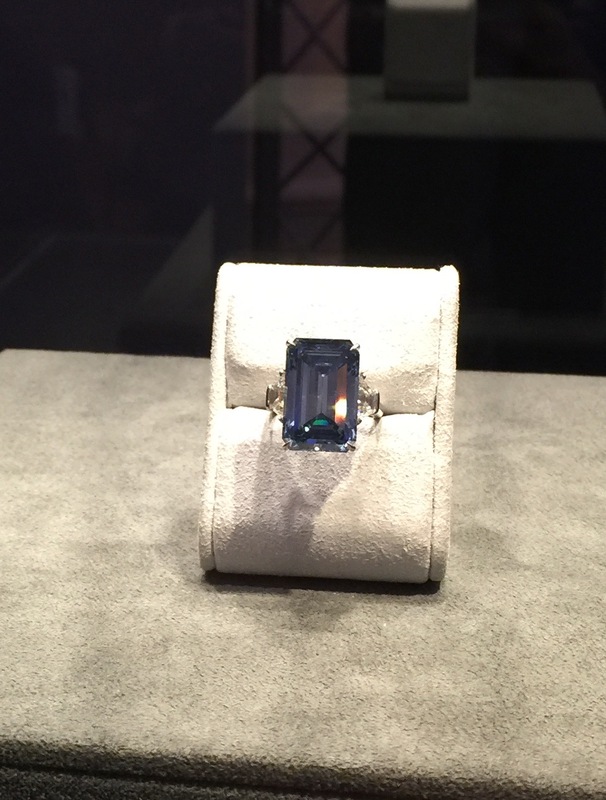 The next market test will be in Hong Kong at the end of the month as well as in New York next month when Christie’s, again, offers the largest Fancy Intense Blue diamond ever to appear at auction, “The Cullinan Dream”, by a mile…which already has a new record title, and may have another few once sold.